First obtain the lime zest, by finely grating the outside peel. Then in a medium-sized bowl combine the yogurt, condensed milk and lime juice. Mix well. Next, place the butter cookies in a plastic bag and lightly crush with a mallet. Place a portion of cookie crumbs in the base of each dessert cup. Using a spoon, press down on the crumbs to form a firm base. Spoon a bit of blended lime yogurt on top and garnish with some extra lime zest. Serve immediately. For a firmer base of cookie crumbs, mix two tablespoons of melted butter into the crushed cookies before transferring to the dessert cups. This dessert can also be kept covered in the refrigerator to serve later the same day. With only five simple ingredients you can prepare a refrescante, smooth and delicious treat. 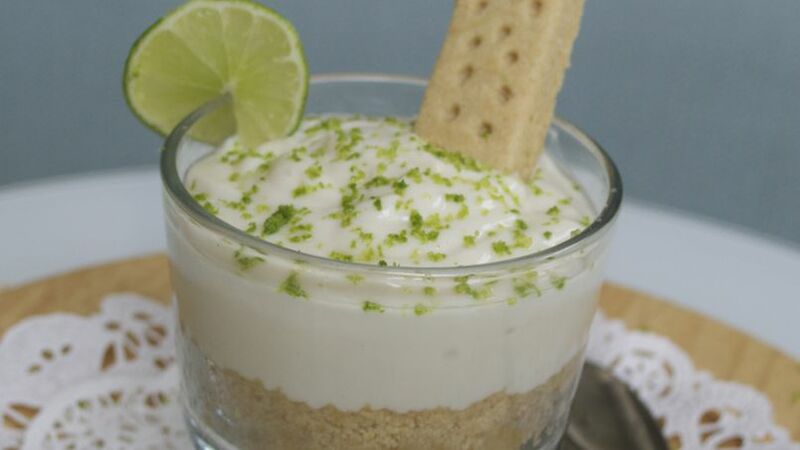 You'll need some butter cookies, yogurt, fresh lime juice, zest and condensed milk. Let's get started–this dessert is going to be ready in five minutes!